The EZ-PC Tower is similar to Eyetech's Mk-IV tower, however it's designed to house both a PC and an Amiga using the Siamese system. 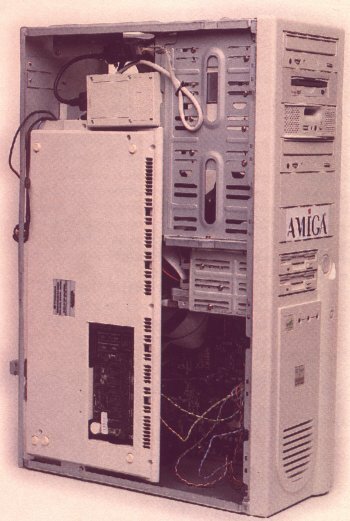 The PC motherboard is mounted in one half of the tower whilst the A1200 motherboard is mounted in the other half. They are connected via a PCI ethernet card in the PC and a PCMCIA ethernet card plugged into the A1200. You effectively control the Amiga from the PC side via the Siamese software which retargets the Amiga's display to the PC.